Do you prefer savoury or sweet recipes? I am firmly in the savoury camp (crisps and cheese are my vices!!). 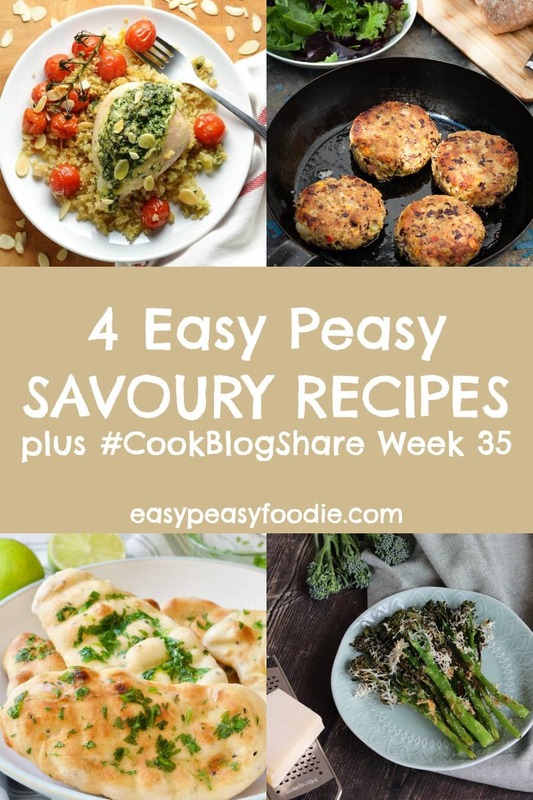 This week I am showcasing 4 delicious and very easy savoury recipes in my CookBlogShare roundup, as well as sharing the linky for #CookBlogShare week 35. OK so BRRRRRRR!!!!!!! Is it cold where you are? It’s FREEZING here (OK comparatively freezing – 3 weeks ago it was around 30 degrees here, now it’s more like 17!). It definitely feels like autumn is coming. Only one more week left of the summer hols. New school uniform and school shoes have been bought. The evenings are getting darker earlier. And it feels about a millions years since we were on our European travels (when in fact it was only just over a week ago!). We had an awesome break, visiting Bruges and Cologne for a bit of culture (not to mention awesome AirBnBs and some delicious meals out!) 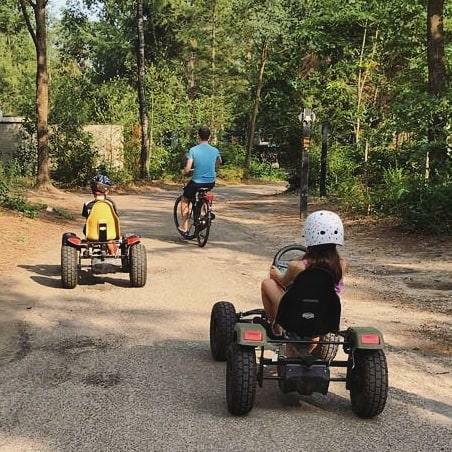 and finishing up in Center Parcs in Belgium for some relaxation and kiddie fun: bikes, swimming, pedalos, tennis, mini golf – honestly, what with all the walking round Bruges and Cologne too, it’s the first holiday I’ve done where I’ve come back fitter than when I left! But now it’s back home and very soon back to school. I have mixed feelings about this (as I am sure most work at home parents do), on the one hand I am sad – I’ve had a lovely holiday with the kiddos and I will miss them when they go back. On the other hand, I am really looking forward to getting back into my usual working routines again, and being able to give my blogs more attention than I have over the summer. Trying to juggle working and kids over the holidays has been a bit tricksy at times. Especially as Productive Blogging is such a new blog and needed quite a bit more work over the holidays than EPF. That said I am super proud of myself for managing to post every week to both of my blogs over the summer and still have plenty of time to spend with the kids. I’m also delighted to have published a couple of really special posts on Productive Blogging over the summer. The first was my very first guest post with Vicki from Honest Mum sharing her wisdom on the topic of How to be your own best publicist and the second was a post where I interviewed 7 PR professionals on how bloggers can best work with PRs. Their answers were really interesting. Definitely essential reading for all bloggers who wish to work on sponsored posts and improve their fees! You can find it here => How bloggers can best work with PRs and brands: what the PR professionals say. Sorry for the slightly tenuous link between my roundup recipes this week. I found it hard to choose from all the deliciousness that had been linked up last week over at Glutarama and no theme seemed to immediately grab me. So I basically picked out the 4 recipes I would most like to eat! Top tip if you are ever linking up the week before I host CBS – I am much more likely to pick savoury recipes than sweet! Partly because I much prefer savoury food (crisps and cheese are my vices!) and partly because I am trying to be healthy and avoid sugar!! These 4 recipes caught my eye, not only because they looked delicious but also because they were easy – and you all know how much I love and easy (peasy) recipe!! 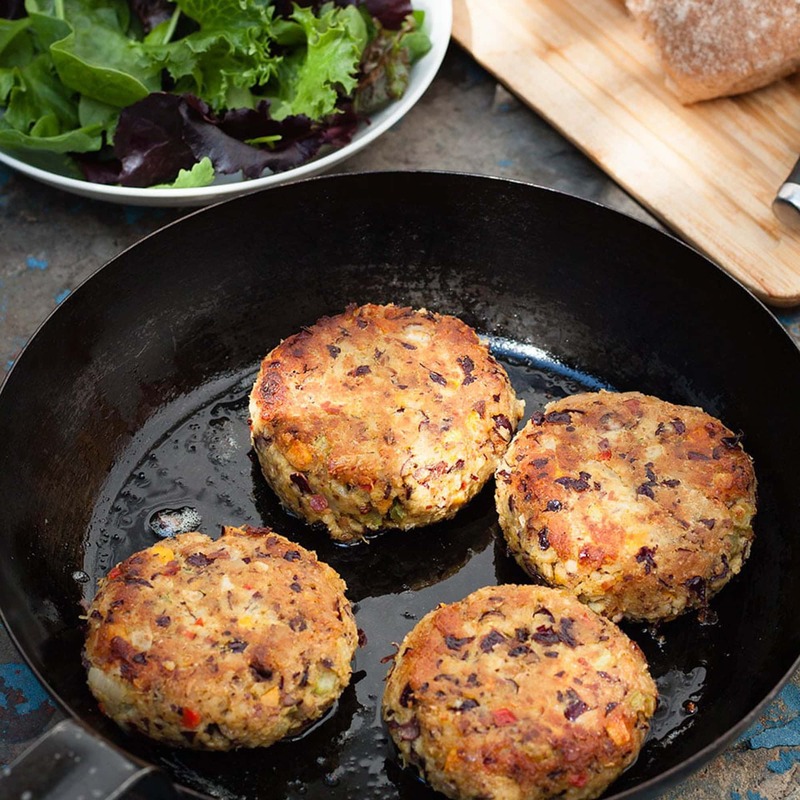 First up are these delicious Spicy Bean Burgers from Jacqui over at Recipes Made Easy. I love how easy these spicy veggie burgers are to make – and only 20 minutes prep time (1h in total to include chilling and cooking) – perfect for busy weeknights. Serve them in a wholemeal bun, with a salad on the side, and they are pretty healthy too. Next up are these fab Easy Naan Breads from Jo’s Kitchen Larder. 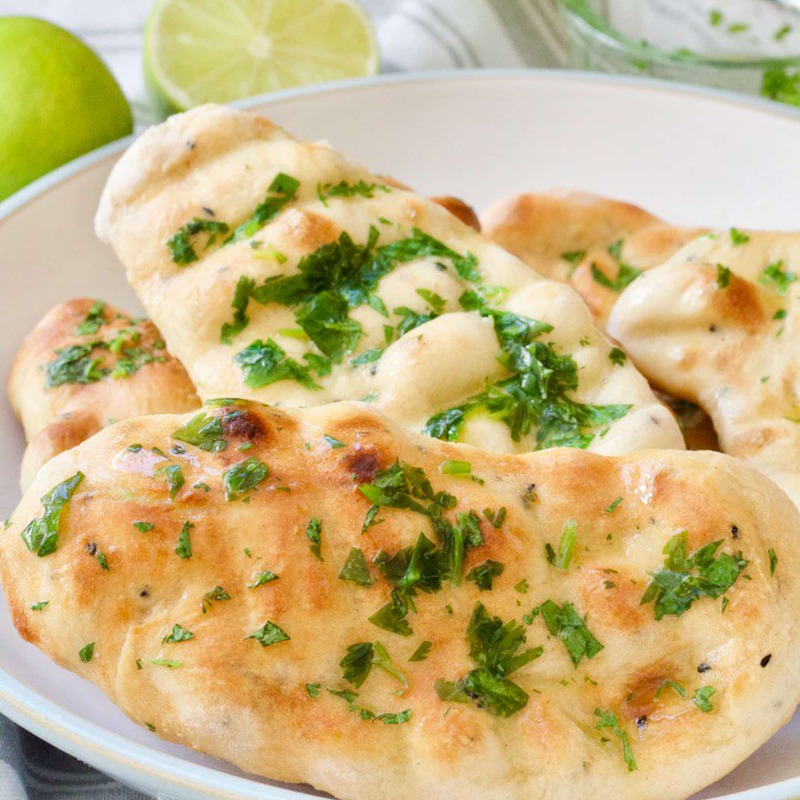 These delicious sounding garlic and coriander naans are not only easy but they are also quick – just 10 minutes prep and 10 minutes cooking time (plus 30 minutes to 1 hour resting time) and you don’t even need to use yeast! These would be perfect to serve alongside a homemade curry!! 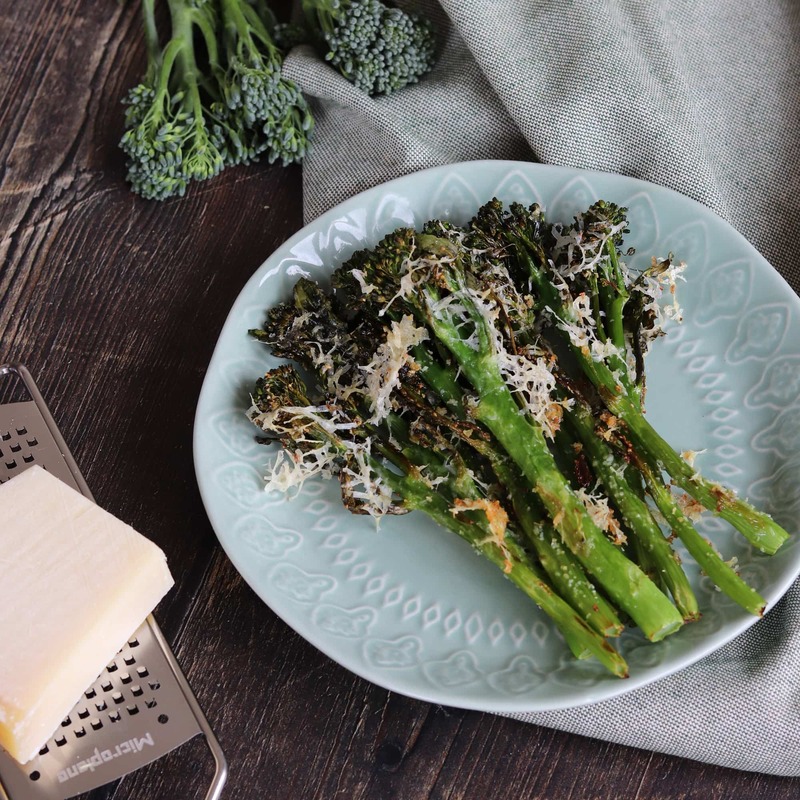 I am a big fan of tenderstem broccoli AND parmesan, so I couldn’t not include this delicious sounding recipe for Roasted Parmesan Tenderstem Broccoli from Cat over at Curly’s Cooking. Cat simply roasts the tenderstem broccoli in the oven with a little oil, salt and garlic, then sprinkles over the parmesan and pops the broccoli back in the oven until the cheese melts. So simple, but I can just imagine how good this dish tastes – and best of all this recipe takes just 17 minutes from start to finish! I absolutely adore the sound of this recipe – and how it looks! 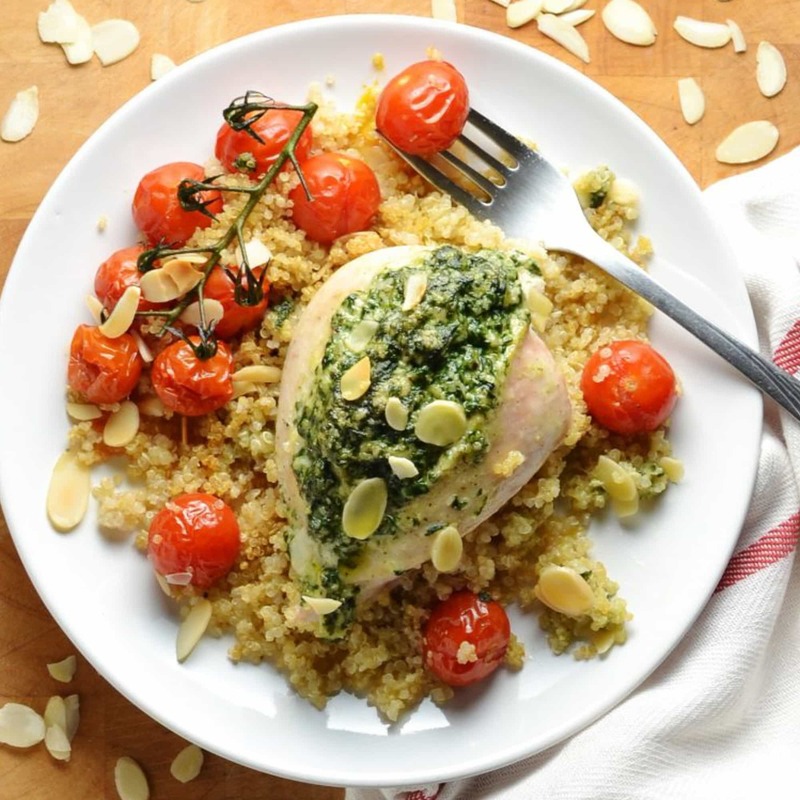 Created by Monika over at Everyday Healthy Recipes, this Spinach and Almond Stuffed Chicken Breast with Quinoa and Tomatoes is the sort of meal that looks fancy, but is in fact super easy to make AND it’s healthy too. Equally great for a quick and easy midweek meal or for hassle free entertaining, it requires minimal preparation and is ready in just 45 minutes! I am team savory as well and these all look amazing. I’m all mixed feelings myself at the moment! It’s so hard to get things done with kids around but as you say it’s been a fun Summer and I will miss them for sure. Can’t wait to set my new super productive working routine with both kids at school though 🙂 in fact I’m super excited about it! What a delicious looking round up! My kids went back to school last week and I have to say, I’ve missed having them around the house during the day. They are on the countdown until the October holidays already! Where DID the summer go?! Here, it’s unseasonably chilly with tons of rain (we’re having some serious flooding issues in my area). I can’t believe it’s already time to break out the comfort food! Your Belgium trip sounds just dreamy. I plan to travel “across the pond” one of these days, but that likely won’t be until all the kids are in college! Thanks for the great roundup and linky! Great round up.They all look incredible. I am sooooo ready for back to school!! !Thank the Lord!! Would love to have the naan and bean burgers anytime. My holidays are usually where I need to walk a lot and its more fun as I get to see new places. Come back home and sadly fitness takes a back seat though I don’t have a very busy schedule. Thank you for adding me the group. Hello, Awesome work….want to join the cookblogweekly share. I have addded the badge on my homepage,pls let me know how to go forward with it.